Alarm Horn & Light Audible warning sound when system is activated by flow switch. Top mounted visual warning light when system is activated. Hand Held Body Wash squeeze valve nozzle on 8’ coiled hose and bracket. Can be used to rinse all body parts while victim is sitting or lying down. Wall or hood mounted, 3/8 NPT, barrier free. Deck mounted next to sink. Activates when pivoted. 1/2" NPT. Barrier free. Hand Held Eye/Face & Body Wash Mounted on the front side-wall of the fume hood. 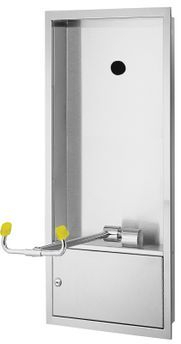 Includes 8’ hose and surface escutcheon. 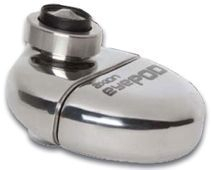 Faucet Mounted Eyewash, uses the new inverted flow design. It is the only product on the market that provides a Medically Superior Response consistent with all EMT, emergency room doctors, and Doctor’s office protocol. 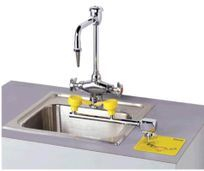 Mounts next to the sink, for quick response to laboratory eyewash demands Ideal for Laboratories with limited space. Designed to allow testing of emergency showers. emergency showers are tested on a weekly basis. Kit includes support ring to hold nylon sleeve in place and divert water into bucket or drain.Bucket to catch water, also acts as a storage space for the test kit.